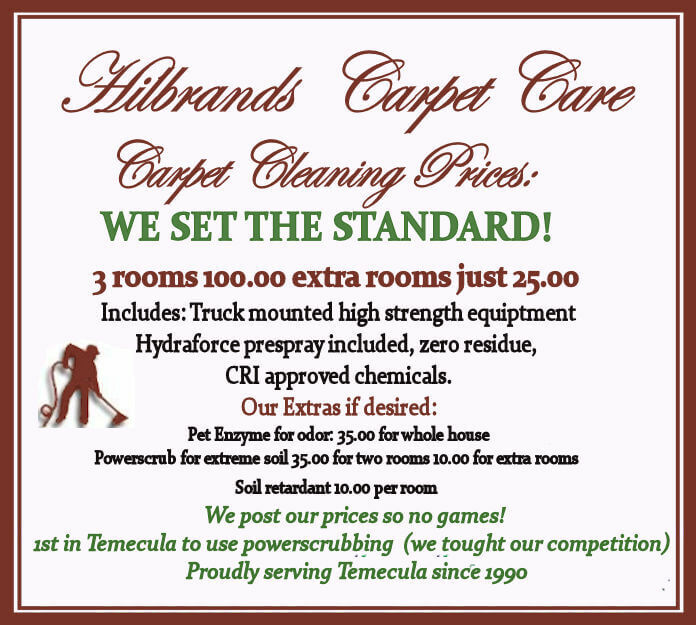 Welcome To Hilbrands Carpet Care in Temecula, CA here is a list off all the Cleaning and repair prices we offer. You may browse below or click to instantly go to section. I have made Carpet cleaning prices easy and set a low price that includes vacuuming moving furniture and spotting (if heavy soil I can add dual process / scrubber for small extra see below). Larger walk-in closet or bath: 10.00. 3 rooms and hall: 115.00 or with stairs 150.00. Extra rooms 25.00. Small home: 5 rooms and hall 165.00,or with stairs 200.00 Extra rooms 25.00. Average home: 7 rooms and hall 215.00 or with stairs 250.00. Extra rooms 25.00. Some services are extra if desired. I have set a low price for these services and rarely mention them unless obviously needed. Soil Retardant: 10.00 per room. We are a licensed Stainguard applicator. One of the best soil retardants I have used. While many over dilute or even worse fail to apply we use as directed and can demonstrate this by drying it on a paper towel in the microwave and then inserting it water to show water repellency. Dual Process: 25 for two rooms extra rooms 10.00 per room. Rather then leaving some rooms partially soiled we can power scrub them before steaming the carpet so its added to only the dirtiest of rooms (usually two or three). This is what sets our company apart from others and has made us preferred by many property managers. Speed drying: 25.00 (blower rental pick up next day). Red-Out: 35.00 for hand size red stain removal. Pet spots are best treated with enzyme and needs to be fresh and cool until use. (it decreases efficiency as it ages). Each spot must be located and saturated through to the pad (a lot on each spot). I use a black light to locate but darkness is required or use eyes and nose for more obvious areas. I also can lift carpet and see damage on backing and then replace a corner of saturated pad and spray underneath for slightly more. Deodorizers which help but have no long term solution can be added to steam chemical. Many co.'s price for a lot more. I use a chemical which also has some antimicrobial properties smells like cinnamon and many people feel it makes home smells disappear. We do all process to clean any fabric for one low price. Different processes are used for different fabrics. They are All fabric rinse (slightly acidic to avoid bleeding and browning), Foam cleaning (usually used with all fiber rinse to avoid residue), and steam cleaning strongest. It is common to use combinations of processes above based on conditions. For instance a microfiber sofa's biggest issue is it can get crushed and show streaks in it so I steam all spots and soiled areas, then spry rinse and extract using special velour tool that has holes in it vs. a slit (it gives a smooth lay), then I towel smooth to make lay perfect. Other examples is a rayon where you need to keep very dry so a rinse is only used, but on a dirty edge it would be foam cleaned, then rinsed. Dining chair: 10.00 seat only 15.00 with back. Sectionals: are priced based on what pieces they compare too. A sofa and a loveseat size (most common) would be 110.00. 2 sofa size would be 130.00. Larger U shaped might include an easy chair (35.00) or even another sofa (65.00). Best possible repairs for less. My Repairs have made me famous. As a repair specialist I have taught classes in repair. So whether you choose me due to my low price or high quality you can be sure that I will do a good job and be careful with your carpet. A lot of skill is required to make the repair as unnoticeable as possible. Wear, color, and carpet quality all most be considered. I do not charge extra for Berber as I actually like to repair it. Restretch: 100.00 for a average room 125.00 large room. walkin closets and baths are 45.00. L shaped or divided rooms would be priced as 2 small rooms. Stairs are 7.50 each. Furniture moving is typically added if necessary 25.00 to 40.00 per room. To stretch we use a power stretcher and carpet is tucked and trimmed. In some cases moving furniture is waved or reduced if numerous rooms or light to few pieces of furniture so its best to call for a quote. Reattatch to tack strip: Small corner or doorway 35.00 about 3 feet. Larger would be a room restretch. (when new tile floor was installed) includes Tack strip and small stretch. Carpet Repair: 75.00 for hand size up to 150.00 for large repair. Removal of iron burn, un-removable stain, fix hole, pet damage etc. Seamed in using seeming iron not two sided tape! We do all process for one low price. My grout cleaning service is the most thorough you can find. After doing hundreds of grout jobs I have found that spraying the grout with an acidic tile cleaning solution and then scrubbing every grout line with a V shaped grout pole brush causing the grunge to lift prior to steam cleaning. After the grout looks clean I then steam and extract using truck mounted high strength machinery this rinses the grout and steams the tile clean. The final step is I dry using numerous towels not left to air dry as some companies so I leave a very clean finish. While not required sealing is available. Process is get a section clear, clean and dry, then move furniture back and continue working through the tiled areas. Power Scrubbing: 15 cents per square foot This is unusual but for very soiled textured tile, (not grout as it is handled with pole brush and most tile cleans with rx20 pressure washing after the pole brush). I estimate square footage over the phone so I can give you a price and then measure at the time of the appointment correcting my estimate. This generally is about 1/2 of what other companies charge especially in home estimate companies. The typical job is the downstairs hall around to garage laundry and bath, plus the kitchen and eating area and usually totals around 500 square feet so would be 200.00. Adding a family room the total becomes about 700 square feet so about 280.00. On some large homes with everything tiled downstairs we sometimes hit 1,000 sq. feet or 400.00. Some caveats with measuring is that we include kitchen island as if it were tiled (due to low sq. footage and how much harder edges are) and a bathroom or other area separated by carpet as at least 50 feet. My phone estimates are rarely off by more then 100 square feet which would be 40.00. We can complete your flood damage without gouging. With the "use it you loose it" insurance today I realize that the repair should be paid by the customer not insurance (I've heard insurance will raise rates for everything from an inquiry to a previous owner having a flood with increases of 1,000.00 per year possible). So be careful when company's say just pay the deductible and they will bill the insurance co even though they are over charging. I do most floods for 500.00 to 1,000.00 not 10,000.00 as some companies charge. For do it yourselfers. I made a step by step it may be incomplete as experience causes more or less steps to be used so you may damage your homes value you can see it here. Move furniture off of wet carpet. 2nd day: If wall has been opened we would have scheduled wall repair and molding install. This is done prior to carpet install as carpet presses against moldings. wall repair is generally after 3 days and carpet install is done day or two following wall repair. Call for prices adjusted for your needs. 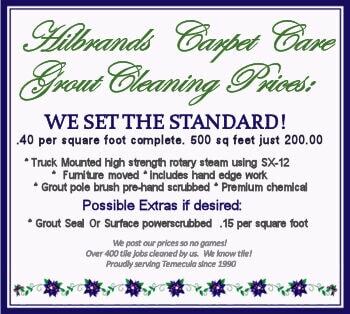 I usually price on phone and stick to estimate so even though I'm one of the few carpet cleaners in temecula that post all prices on line so don't fear a large total just call.